Join the protest, starting at 11 a.m, Friday April 15 in New York City's Union Square at the doors of Bank of America. Visit "It's Our Economy" online for more information on the protest and concert, on the web and on Facebook. The organizers have set up a website, and there’s more information on their Facebook page. We will not halt the laying off of teachers and other public employees, the slashing of unemployment benefits, the closing of public libraries, the reduction of student loans, the foreclosures, the gutting of public education and early childhood programs or the dismantling of basic social services such as heating assistance for the elderly until we start to carry out sustained acts of civil disobedience against the financial institutions responsible for our debacle. The banks and Wall Street, which have erected the corporate state to serve their interests at our expense, caused the financial crisis. The bankers and their lobbyists crafted tax havens that account for up to $1 trillion in tax revenue lost every decade. They rewrote tax laws so the nation’s most profitable corporations, including Bank of America, could avoid paying any federal taxes. They engaged in massive fraud and deception that wiped out an estimated $40 trillion in global wealth. The banks are the ones that should be made to pay for the financial collapse. Not us. And for this reason at 11 a.m. April 15 I will join protesters in Union Square in New York City in front of the Bank of America. If you are among the one in six workers in this country who does not have a job, if you are among the some 6 million people who have lost their homes to repossessions, if you are among the many hundreds of thousands of people who went bankrupt last year because they could not pay their medical bills or if you have simply had enough of the current kleptocracy, join us in Union Square Park for the “Sounds of Resistance Concert,” which will feature political hip-hop/rock powerhouse Junkyard Empire with Broadcast Live and Sketch the Cataclysm. The organizers have set up a website, and there’s more information on their Facebook page. We will picket the Union Square branch of Bank of America, one of the major financial institutions responsible for the theft of roughly $17 trillion in wages, savings and retirement benefits taken from ordinary citizens. We will build a miniature cardboard community that will include what we should have—good public libraries, free health clinics, banks that have been converted into credit unions, free and well-funded public schools and public universities, and shuttered recruiting centers (young men and women should not have to go to Iraq and Afghanistan as soldiers or Marines to find a job with health care). We will call for an end to all foreclosures and bank repossessions, a breaking up of the huge banking monopolies, a fair system of taxation and a government that is accountable to the people. Bank of America is one of the worst. It did not pay any federal taxes last year or the year before. It is currently one of the most aggressive banks in seizing homes, at times using private security teams that carry out brutal home invasions to toss families into the street. The bank refuses to lend small business people and consumers the billions in government money it was handed. It has returned with a vengeance to the flagrant criminal activity and speculation that created the meltdown, behavior made possible because the government refuses to institute effective sanctions or control from regulators, legislators or the courts. Bank of America, like most of the banks that peddled garbage to small shareholders, routinely hid its massive losses through a creative accounting device it called “repurchase agreements.” It used these “repos” during the financial collapse to temporarily erase losses from the books by transferring toxic debt to dummy firms before public filings had to be made. It is called fraud. And Bank of America is very good at it. US Uncut, which will be involved in the April 15 demonstration in New York, carried out 50 protests outside Bank of America branches and offices on Feb. 26. UK Uncut, a British version of the group, produced this video guide to launching a “bail-in” in your neighborhood. Civil disobedience, such as that described in the bail-in video or the upcoming protest in Union Square, is the only tool we have left. A fourth of the country’s largest corporations—including General Electric, ExxonMobil and Bank of America—paid no federal income taxes in 2010. But at the same time these corporations operate as if they have a divine right to hundreds of billions in taxpayer subsidies. 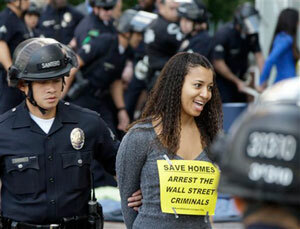 Bank of America was handed $45 billion—that is billion with a B—in federal bailout funds. Bank of America takes this money—money you and I paid in taxes—and hides it along with its profits in some 115 offshore accounts to avoid paying taxes. One assumes the bank’s legions of accountants are busy making sure the corporation will not pay federal taxes again this year. Imagine if you or I tried that.